Here is the picture of my new Yamaha 150 that’s on my boat which stays in Tampa FL salt/brackish Hillsborough river. Today I tried aluminux which did a pretty decent job loosening the barnacles but still had to use a brush and plastic scraper, espically in the tight places. You were going to show this to your tech people for best product to remove barnacles mainly on the outdrive yet not hurt the paint or fiberglass boat. Needless to say, it would be better if you had a product that keeps the critters off to start with. My transducer is an issue also and manufacturer suggested NON-MATALIC transducer anti foul spray. I’m not sure why you used Aluminux. 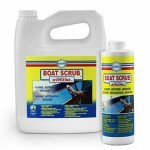 It’s a caustic etch for aluminum and can bight into aluminum and remove some of the metal, remove paint and soften and damage gelcoat, if your get it on your boat. I’ll try to answer your questions, based on the limited information that I have and the photograph that you sent. 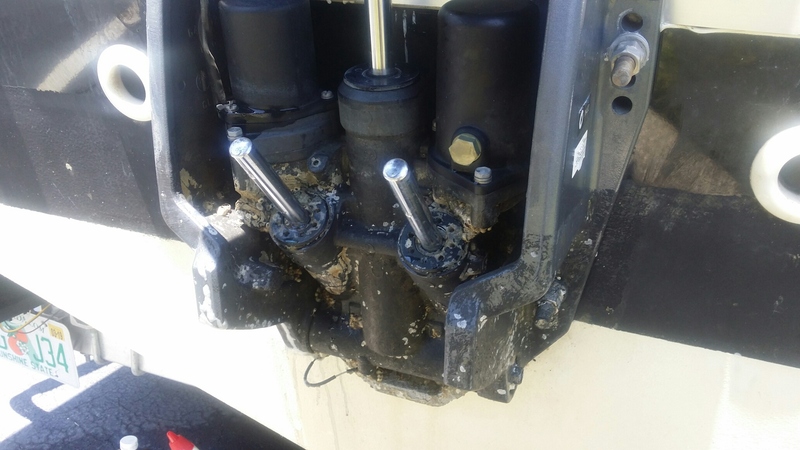 It appears that you are having the greatest difficulty with inaccessible areas of your outboard motor and Seema mentioned that you had problems with barnacles on your transducer. It looks like your boat is on a trailer and I assume from the relatively clean bottom that you haul the boat from time to time to clean the bottom. You only sent one close up so I’m guessing. It looks like your boat has stains and is oxidized, so I’m assuming that it’s older or you’re not using the right products to look after it. You can use Algex to loosen up the barnacles, without damaging the paint, metal, plastic or gelcoat, if you get some on it. You will still need to brush and scrape them off and re-apply the Algex to soften the rings and scrape and brush them away. Then you can apply VS721 to protect those areas. VS721 will prevent barnacle attachment as long as you can keep the slime off the treated areas. You’ll need a stiff bristle brush to get it into all the nooks and crannies. If you haul your boat whenever slime starts to appear and pressure wash it off of wipe it off with a sponge, you won’t get any growth. VS721 is clear, thin and non-metallic so you won’t have any problems with galvanic corrosion, build up or interference with your transducers. 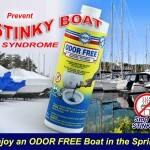 We’re working on better and more permanent solutions but so far this is the best there is, short of anti-fouling paints, and they have their own problems.So, there is no ideal solution other than keeping your boat out of the water and that’s not always an option. Bacteria in the water attaches to everything and.In the water it forms slime. Slime is loosely held in place on the surface and can be easily removed, especially from a smooth and slick surface like VS721. Movement through the water removes it. Bacteria is food for higher life forms. Next,algae is attracted to the bacteria and attaches to the substrate so it can feed on the bacteria. 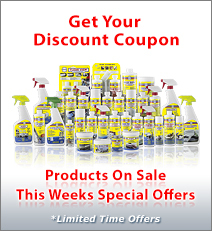 It’s microscopic so it also anchors in the gelcoat pores and other irregular surfaces. It’s much more difficult to remove, but is easily removed from VS721. Algae is very complex and can be single celled that resembles slime or multi-celled, such as seaweed. Some are animal, others plant and still other mixotrophic (both). Algae is food for higher life forms; fish, tiny seahorses, worms, mussels, etc. and yes, barnacles. Barnacles attach to the substrate, your boat, with a very strong protein polymer adhesive (the toughest on the planet). Scientists know what the adhesive is and how it’s made, but to date, no one has been able to synthesize it. Barnacles also like to attach to irregular or porous surfaces where it can get a good grip and anchor themselves to the surface. 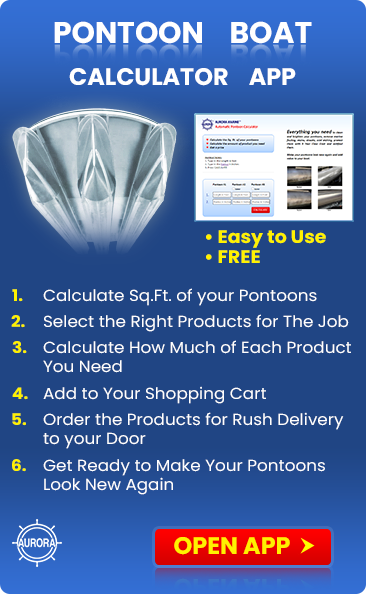 This reduces the chances of being swept away by current or other disruption. Barnacles have a calcium or calcite shell which is similar to limestone or marble and is difficult to remove. 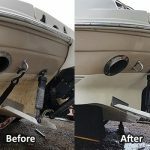 Over time, chemicals can dissolve it but few boat owners have the patience, so the best solution is to soften the shells with a special chemical like Algex and scrape them away. Same for the adhesive. VS721 seals the pores in the gelcoat and provides a very slick surface (more slippery than Teflon). This prevents algae and barnacles from getting a grip in the pores so they must stick to the surface, where they are easier to remove. If you can keep the slime from building up, you deprive the higher life forms from food and they will not attach. VS721 makes it easier to remove slime and other life forms that are new and not yet well established. Given enough time, Barnacle adhesive will penetrate through the VS721 and attach to the substrate. 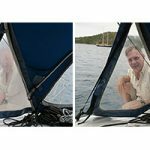 They can do the same through anti-fouling paint. Mature barnacles are difficult to remove.